Prof. Irene Akua Agyepong is a Public Health Physician in the Research and Development Division of the Ghana Health Service (GHS). 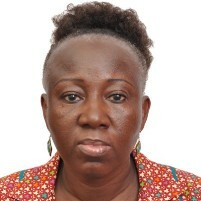 She spent three years full time secondment between October 2012 and December 2015 in the University of Ghana School of Public Health, where she had previously taught and supervised students part time since its inception in 1994. She was Regional Director of Health Services for the Greater Accra region of Ghana between 2004 and 2012. She was first chair of the Board of Health Systems Global (2012 – 2014). She was Professor Prince Claus Chair in Development and Equity, University Medical Centre, Utrecht in the Netherlands between 2008 and 2010. She has been Chair of the Scientific and Technical Advisory Committee (STAC) of the Alliance for Health Policy and Systems Research and the Implementation Research Platform of the World Health Organization and a member of the American National Academy of Medicine Commission on Creating a Global Health Risk Framework for the Future. She was awarded the Arnold Kaluzny distinguished alumni award of the Public Health Leadership program of the University of North Carolina at Chapel Hill in 2008. She is a member of the Independent Advisory Committee for the Global Burden of Disease. She has published extensively in the field of health policy and systems research. She has a Medical degree (MBChB 1986) from the University of Ghana Medical School; a Masters in Community Health (1991) from the University of Liverpool School of Tropical Medicine UK; a Doctor of Public Health (2000) from the University of North Carolina at Chapel Hill (UNC-Chapel Hill) and part 1 of the West Africa College of Physicians and Surgeons in Public Health. She is a Foundation Fellow of the Public Health Faculty of the Ghana College of Physicians and Surgeons; and Honorary Professor in the Division of Health Systems and Policy of the School of Public Health and Family Medicine of the University of Cape Town.